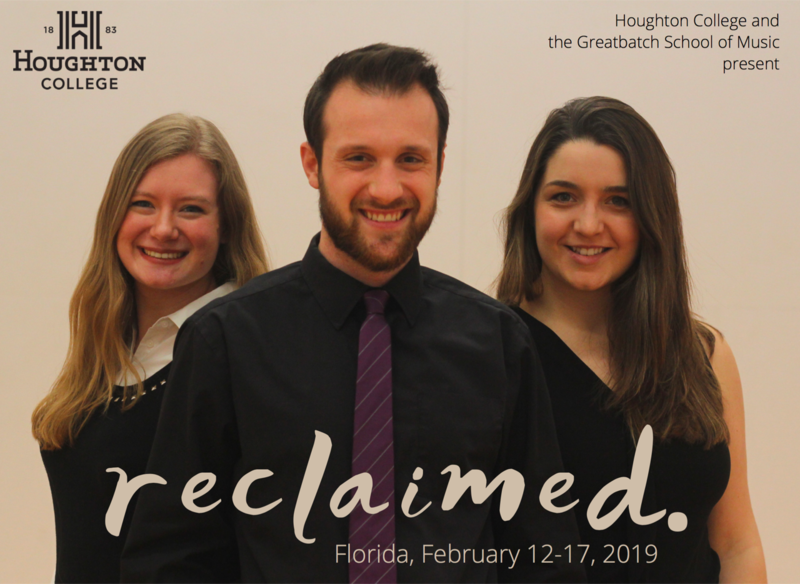 SAINT AUGUSTINE – “Reclaimed,” a trio of top singers from New York’s Greatbatch School of Music at Houghton College will perform a free concert on Tuesday, Feb. 12, at 7 p.m. in the acoustically dynamic and elegant setting of the St. Augustine Art Association Main Gallery. Currently on their spring promotional tour for the College, the singers have captivated audiences of all ages with their harmonies, soaring voices and versatile repertoire from pop and classical to musical theatre. Doors open at 6 p.m., so visitors may enjoy the current art exhibition, “Black, White & Shades of Gray.” A goodwill offering at the door will be accepted. The St. Augustine Art Association is located at 22 Marine Street. Parking is free downtown after 5 p.m.
To reserve a seat, call (904) 824-2310. To learn more, go to www.staaa.org or www.houghton.edu.